The 1914-1918 war – often symbolised by a poppy – has generated millions of creative responses across the decades, so that very few new works can make fresh inroads into its contested space. During the centenary of the Gallipoli landings, many creative minds have turned to the task of commemoration and mourning, and for those fascinated by the conflict, the pickings are rich. In This Intimate War, Robyn Rowland succeeds in bringing some new, personal, and arresting perspectives. This collection of poems offers a striking dual vision. Creatively, the book is a triumph, and Five Islands Press is to be congratulated on the standard of its production. Like the recent centenary offering ‘Reflections on Gallipoli’ by the Australian Chamber Orchestra, This Intimate War offers us a hybrid, stereoscopic view of the conflict. The cover image, a reproduction of the painting ‘Mehmetçik ve Johnny Mehmetçik’ from the Canakkale series of modern Turkish artist, Fehmi Korkut Uluğ, intriguingly blends the shapes, emotions and motives of the two soldiers pictured, so that at first glance it is not clear which is the Turk and which the invader, or who is supporting whom. 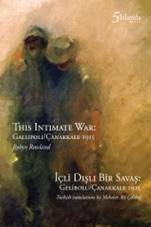 The decision to face each poem with its Turkish translation, while effectively halving the reading experience for those not competent in both languages, is a sharp and provocative representation of the anomaly of the Gallipoli campaign itself: two armies, previously unknown to each other, facing off in a fight to the death. In this passage, the allied soldiers do not descend from the belly of the Trojan horse but are vomited onto the shore, much in the manner of the malformed offspring of the disgusting Errour in Spenser’s ‘Faerie Queene’. Rowland deliberately makes repeated interchanges between the ‘hero’ (Trojan) allusions and the less heroic, ‘invader’ identity of the Allies. These fluctuating perspectives provide valuable reflections on the nature of war and warfare. While at first disconcerting, this technique underscores the multiplicity of viewpoints, the fragmentation of individual experience, and the pathetic confusion of war. Rowland captures each perspective for a fleeting moment, and then bends that moment into manifold refractions. For eight months they fought on with no real gain. If, indeed, there was ever need for an initial Troy. This Intimate War explores consciousness and context well beyond our typical Australian appropriation of Gallipoli to ourselves – that narrow understanding of ours that diminishes the entire Gallipoli peninsula to single, bloodied, narrow beach at Anzac Cove. Rowland presents us with a myriad of those involved. Here we have words from (and for) Allied troops of many backgrounds, from the Turks, from women on the production line at home, from widows, from bereaved mothers, from child soldiers and from those left to care for the disabled. Rowland is so comfortable with the Irish and their problematic, un-reconciled Great War experience that ‘The Green Road’ may be somewhat mysterious to many Australian readers. I hope they follow up their confusion with more reading about this defining war. Rowland’s treatment of the Great War is, of course, informed by much of the writing that has preceded it, and sometimes leans a little heavily on well-worn tropes. Yet unlike the protest poems of Wilfred Owen, Rowland’s work captures more than fleeting, individual cries of hopelessness and despair. This Intimate War is a well-informed, twenty-first century interpretation which adds important perspectives to our consideration of this war in particular, and of war in general. Clare Rhoden’s book The Purpose of Futility: Writing WWI, Australian Style, was published by UWAP Scholarly in 2015. Her latest short fiction, ‘Man/Machine/Dog’ appeared in Overland 215 (Winter 2014). Clare completed a PhD in Creative Writing at the University of Melbourne where she works as Teaching and Academic Resource Coordinator in the Department of Management and Marketing.